Accurate shooting begins and ends with the human eye. You can only hit what your eyes can see. Your career as a marksman won’t last long if you don’t use good eye protection every time you go to the range and/or handle a firearm. Every year, 1,000,000 people suffer serious eye injuries. Shooting is hazardous–it is estimated that there are 30,000 firearms-related eye injuries each year (if you include paintball sports.) After paintball, general hunting accidents comprise most firearms-related eye injuries. Quality eye protection need not be expensive. 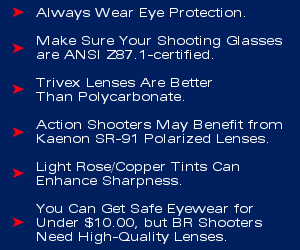 You can find comfortable, ANSI Z87.1-certified shooting glasses for under $10.00. If you select shooting glasses carefully (using the criteria we describe in this article), and ensure that your eyewear is safety-certified, inexpensive shooting glasses can perform very well. But you need to avoid cheap, soft-plastic lenses that claim “impact resistance” without satisfying a testing standard. This editor was recently chatting with a regular site visitor who mentioned that he finds safety glasses annoying and sometimes he chooses not to use them when he’s just out practicing by himself. I abruptly replied: “Well I hope you don’t mind living out your days with a glass eye like Peter-Paul Von Mauser.” The legendary German rifle-maker lost the use of one eye when a bolt failed in one of his test rifles. Remember, this can happen to anyone. You need safety glasses when handling any firearm, whether pistol, rifle, or shotgun. This writer speaks from personal experience. Five years ago, while shooting an HK USP .45acp pistol, the gun’s firing pin sheared in half. Propelled rearward by the recoil action of the slide, the rear section of the firing pin came out of the back of the gun and struck me square in the middle of the left lens of my shooting glasses. I imagine I would be wearing an eyepatch right now had I not been using eye protection. 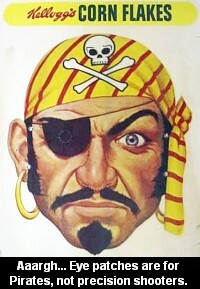 That may be a fashionable look for pirates, but I’m grateful I’ve still got two good eyes left. Proper eye protection is a “must” for all shooting sports. Even when shooting rimfire guns you should wear eye protection. A wide variety of styles and shapes are available. 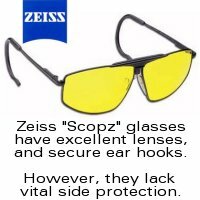 However, any shooting glasses you choose should provide ANSI Z87.1 safety standard impact protection. We see many shooters that just wear ordinary glasses with non-tempered glass lenses. That’s not wise. Ordinary glass lenses can shatter on impact. Cheap plastic-lensed sunglasses also lack impact-resistance and may break into dangerous sharp-edged pieces when hit by projectiles. If you doubt the need for safety glasses, check out the video above. The ricochet barely missed the shooter’s left eye. When choosing Shooting Glasses, nothing is more important than impact protection and barrier protection against projectiles. Lens color, fit, etc. are all important, but no eyewear is worth owning if the lens won’t properly protect your eyes. Impact resistance ratings are promulgated by the American National Standards Institute (ANSI), Occupational Safety & Health Administration (OHSA), and the U.S. Military. These entities have standardized tests for eyewear impact resistance. OHSA Safety Standard 1910.133 requires impact resistant lens AND “eye protection that provides side protection when there is a hazard from flying objects.” ANSI standards for impact resistance are outlined in articles Z87.1 and Z87.3. These standards were provided to ANSI by the American Society of Safety Engineers (ASSE). The U.S. Military uses a standard called MIL-PRF-31013, a tough .15 caliber ballistics impact test. 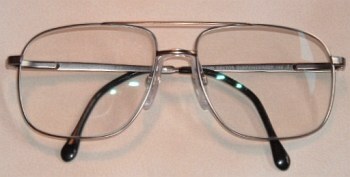 U.S. Military eyewear must pass this standard before being issued to any U.S. military personnel. The ESS is one of the few eyeshields on the market with all three impact certifications: ANSI Z87.1, OSHA, and the tough military MIL-V-43511C test. 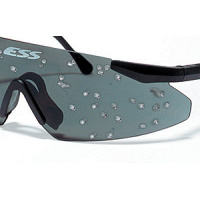 ESS eyewear can stop shotgun pellets at 10 yards. 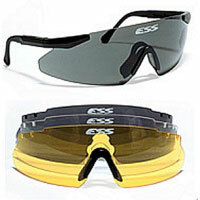 ESS safety glasses, with interchangeable clear, smoke, and amber lenses, are available from Gunner’s Alley. Prescription inserts are also offered. In addition to providing impact protection, shooting glasses protect your eyes from harmful rays. Thankfully, most of the preferred lens materials for ANSI-certified shooting glasses offer excellent UV protection, even with clear lenses. You do NOT have to select a vary dark or opaque lens to get adequate UV protection. To provide adequate protection, look for shooting glasses that absorb at least 99% of UV radiation. Choose shooting glasses with one of the following labels: “Blocks 99% or 100% of UV rays”, “UV absorption up to 400nm”, or “meets ANSI UV requirements.” CLICK HERE for more info about UV radiation and eye safety. 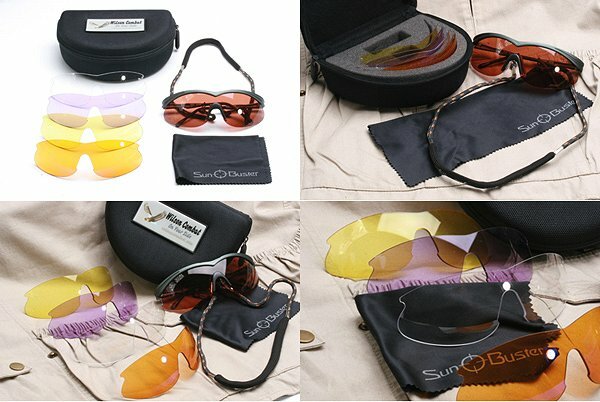 Shown are polycarbonate Wilson Combat® SunBuster® Shooting Glasses kit with 5 interchangeable lenses. 1. Shooting Eyewear Must be Made of Impact-Resistant Material. For now, that means you have a choice of Polycarbonate, Trivex™, or SR-91. Polycarbonate eyewear is relatively inexpensive and widely available from many manufacturers. Trivex is lighter than polycarbonate and has much better optical qualities. However, it is more expensive and is not widely sold by catalogers or big discount houses. SR-91 is a proprietary polarized lens material from Kaenon. It is even lighter than Trivex, has excellent impact performance and optical clarity. But because SR91 is currently available only in polarized form, it is not recommended for precision rifle shooters. It can be great for pistol and action shooters however. 2. Shooting Eyewear Should Be Safety-Certified. Don’t even consider spending a dime on shooting glasses that are not certified for impact protection. You only have one set of eyes. Certification is your best guarantee that your protective eyewear will really do its job. There are three impact standards popularly applied in the United States: ANSI, OSHA, and MIL-PRF-31013 (Military SPEC). We recommend ANSI Z87.1 at a minimum. Eyewear rated as Z87.1+ plus (high impact) is better. And eyewear that satisfies both ANSI Z87.1+ AND the military test is probably your best choice of all. 3. Your Eyewear’s Optical Quality Must Match the Accuracy Demands of Your Discipline. A cowboy action shooter aiming at large targets at 10 yards is perfectly well-served with inexpensive ANSI Z87.1-certified polycarbonate shooting glasses that cost under $10.00. On the other hand, a long-range benchrest shooter aiming through a $1,200 high-magnification scope should be using Trivex glasses with optically correct lenses, delivering minimal distortion and reduced chromatic aberration. To put it bluntly, if you have a $1200 scope sitting on a $3000 rifle don’t try to set world records wearing blurry $3.99 Walmart specials. 4. Shooting Eyewear Should Have Side-Protection. If you participate in any action shooting game, you absolutely need wrap-around glasses to guard against ricochets and splashback from targets. Bench shooters should also consider eyewear with side protection–remember the gun that blows up may not be your own, but the one on the bench next to you. Classic aviator-style glasses look good, but wrap-arounds are safer. 5. Tinted Lenses Can Be Helpful, But Avoid Extremes. Precision rifle shooters using high-magnification optics are usually best served with clear glasses, light gray, pale yellow, or a light rose/amber “blue-blocker” tint. In general you don’t want a dark tint because this blocks too much of the light coming from the scope. However the blue wavelength filtration in quality brownish-rose glasses will sharpen the image and increase apparent contrast. We’ve generally found that the bright yellow and orange lenses favored by some shotgunners don’t work well with scopes. Also, avoid polarized lenses (too much light loss) and mirrored lenses (can cause reflections and odd chromatic distortions). 6. Shooting Eyewear Should Be Comfortable and Fit Securely. This may seem obvious, but we often see shooters with glasses that don’t fit right, that bind at the bridge of the nose or temples, or don’t stay in place. When you’re competing, you don’t want to drop points because your shooting glasses slipped. 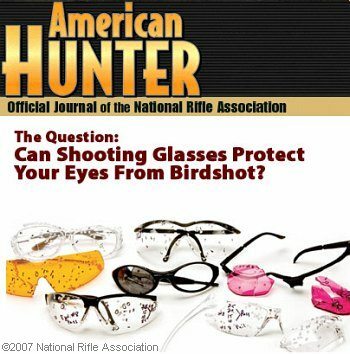 The editors of the NRA’s American Hunter magazine recently tested 10 brands of shooting glasses, determining how well the eyewear could shield users from shotgun birdshot. Eyewear samples were tested at 25, 15, 10, 8, and 5 yards, using #8 shot. One ANSI Z87.1-certified polycarbonate sample was then repeat-tested with #6 shot, #4 shot, #2 steel and buckshot. Read Full Test Report. Polycarbonate, Trivex, and SR-91 — What’s Best? There are three satisfactory impact-resistant lens materials on the market right now–polycarbonate, Trivex™, and SR-91*. For precision rifle shooters using high-power optics, go for Trivex if you can afford it. Action shooters should consider the polarized SR-91 option. But in general Trivex is the first choice for shooting with scoped rifles. When crafted by a quality manufacturer, Trivex does a better job of transmitting light without distortion than polycarbonate. Less distortion means better “sharpness”, improved contrast, and fewer chromatic effects. In short that means you can see the target better. “Developed for military applications, Trivex is stronger, clearer, and lighter than polycarbonate. Most importantly for sports applications, Trivex minimizes distortion called ‘chromatic aberration’, which is distortion that occurs when objects are viewed away from the optical center. Chromatic aberration is best measured by its ‘Abbe Value’. In prescription eyewear, a higher Abbe Value indicates less distortion as your gaze moves away from the center of the lens. Trivex has an Abbe Value of 43, while polycarbonate has a value of 30. *One can also make impact-resistant eyewear from CR 39, but CR 39 is inferior to polycarbonate in most respects. Though roughly the same weight as CR 39 plastic, polycarbonate has a higher impact resistance rating. CR 39 Plastic offers little or no UV protection, while polycarbonate, even in clear lenses, provides excellent UV protection. SR-91 is a new proprietary polarized lens material from Kaenon. SR-91 combines the highest optical quality of the finest glass lenses with the ultra-light weight and strong impact resistance of polycarbonate lenses. On the other hand, polycarbonate lenses are light and impact resistant, but their optical clarity is relatively poor. SR-91 is a good solution (maybe the best) for anglers, sailors, skiers, and other sportsmen who need to filter out excess light and glare. This can be effective if you’re shooting a 3-gun match in bright sunlight, but we don’t recommend polarized lenses of any kind for precision rifle shooting with high-magnification scopes. Why? The answer lies in the nature of polarization. Polarized glasses employ a thin layer of iodine crystals arranged in vertical rows and sandwiched into the middle of the lens. These crystals stop non-parallel light waves from passing through the lens. This does cut “glare” (which comes from non-parallel light waves), but the effect actually blocks a significant amount of light–as much as two F-stops (75% light value loss). All Kaenon SR-91 polarized lenses block at least 50% of visible light, and the darkest SR-91 lenses block a full 88% of visible light! You don’t want to loose that much light when looking through a scope. With scopes in excess of 30-power, the problem is almost always too little light, rather than too much. If, on a very sunny day, the scope is too bright, just use a slightly-tinted pair of glasses, with a VLT factor of perhaps 70-80%. Shooting Eyewear is available in a wide variety colors and tints. You’ll even find mirror coatings, rainbow coatings, and assorted gradients. While flashy mirror-coated lenses or bright orange or vermillion lenses are attention-getters, they really aren’t appropriate for the precision rifle shooter. If you shoot scoped rifles you need at least one set of eyewear that lets in the maximum amount of light–that means a clear lens, or one with a very light gray, pale yellow, or pale rose/brown tint. The lens should have a high Visible Light Transmission Factor (VLT). Clear lenses have a VLT of 90% or higher. A pale yellow lens might have a VLT of 75-85%. When shooting with a scope, even on sunny days, we prefer shooting glasses that have a 50% or higher VLT. Otherwise you are choking off too much light coming through the lens. For very bright days, we recommend a second pair of shooting glasses. We’ve found the most effective darker lens color is a rose/brown color, similar to a warming filter for a camera. 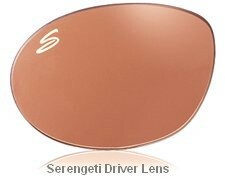 The Serengeti ‘Driver’ lens color is just about perfect (unfortunately Serengeti glasses are NOT ANSI Z87.1-certified). This rose/copper color reduces glare, enhances contrast, but most imporantly, it provides some blue wavelength filtration. Because blue light focuses at a different point than other wavelengths, by filtering it out, far-away objects will appear more sharply focused. The effect is quite real, though is it most noticeable when you’re just looking downrange, rather than through the scope. 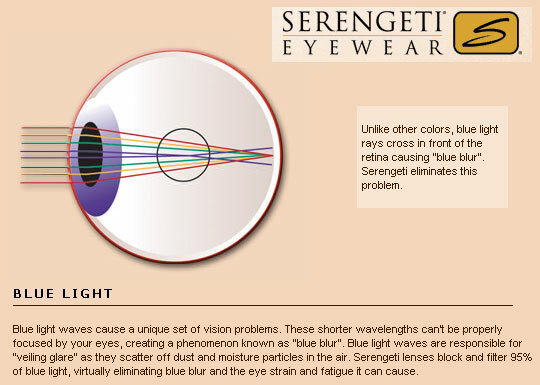 That is because most quality scopes already have lens coatings that provide some blue filtration. The diagram below illustrates how blue filtration enhances perceived resolution and sharpness. This is not a gimmick. You can see the difference immediately. If you can’t afford multiple sets of shooting glasses you can purchase photochromatic “transition” lenses that darken in response to bright ambient light. Danny Reever explains how these work in the section below. The one problem we have with photochromatic lenses is that you may be in a shaded area while the light downrange can still be very bright, appearing harsh when viewed through the scope. What about bright yellow, orange, or vermillion (purple) lenses? These are popular with many shotgunners because they can dramatically heighten contrast and make clay targets easier to see against the sky. However, those intense color tints aren’t appropriate when using a rifle scope. Ideally, you want a fairly neutral lens to allow maximum light transmission. 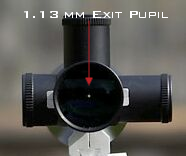 Remember that, with a 36-power Benchrest scope, the exit pupil may be only 1mm in diameter. That means that ALL the light energy and visual information your eye actually receives is contained in a tiny circle. You want that optical information to reach your eye’s light sensors with as little interference as possible. 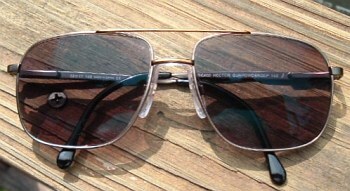 Aviator-style shooting glasses with metal frames are popular with shotgunners and many hunters, but the metal frames can get hot to touch in the sun, and aviator-style glasses lack adequate side protection. In this editor’s personal experience, thin metal frames (even titanium) are much more prone to bending and breaking than plastic. I could fill a suitcase with all the metal frames I’ve broken over the years. 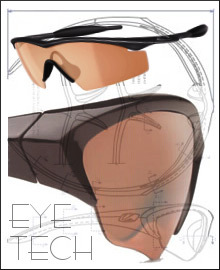 We recommend a plastic or carbon-reinforced frame material with wrap-around lenses to provide side protection. Side coverage is especially critical for Action Shooting where ricochets and bullet “back-splash” are common. Take note that the OSHA Eye Safety Regulations mandate side coverage for safety glasses. Look for eyewear with adjustable frames or flexible temples. Shooting glasses that are too tight on the temples quickly become very uncomfortable. Also, make sure the ear loops are the right length (or the arms offer enough tension) so the glasses stay in place while you’re shooting. Glasses that look great but won’t stay in place are a nuisance. Action and Tactical Shooters should choose glasses that loop behind the ear or can be held on with a Croakies-style strap. You don’t have to spend a lot of money to get good quality shooting glasses. The UVEX line of safety glasses are durable, comfortable, and inexpensive. Featuring interchangeable lenses (including mirrored and UV-blocking styles), UVEX glasses meet ANSI Z87.1-2003, CSA Z94.3 and MIL-STD-662 standards. Uvex safety glasses are the world’s top-selling protective eyewear brand. The popular UVEX ‘XC’ style, at right, comes in a variety of styles, starting at $7.95 per pair (clear lenses). The most expensive you can buy are still under $12.00. Replacement lenses range from $2.50 to $8.50. The UVEX Genesis, shown at right, is our favorite model of the UVEX line. It features extended side shields and has been rated #1 for comfort by an independent testing group. The Genesis, starting at $8.25 per pair, has an elastomer brow guard, and soft, pliable nose pads making it very comfortable to wear for extended periods. It meets the Mil V0 ballistic test for impact. Like the ‘XC’, the Genesis features interchangeable lenses (including Clear, Amber, Espresso, Gold Mirror, and SCT glare-reducing lenses), and four different frame colors (black, brown, Vapor Blue, and Patriot RWB). You can buy UVEX glasses at gunshops or on the internet. You’ll find great prices on UVEX safety glasses (and replacement lenses) at DiscountSafetyGear.com, Cooper Safety, and Tasco-Safety.com. 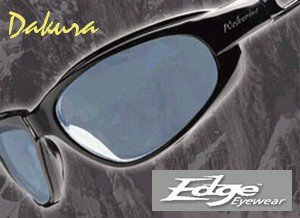 Tasco Safety also carries many other stylish, ANSI Z87.1-approved safety glasses, including the Edge Dakura ($9.25 for Clear, Amber, Smoke, and mirrored lenses), and the Smith & Wesson 30-06 by Olympic Optical ($7.50). 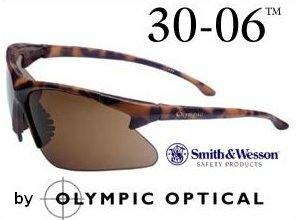 Olympic Optical’s S&W 30-06 is also available in a bifocal model ($11.50) with +1.5, +2.0, or +2.5 power diopters in the bottom of the lens. Danny Reever recently researched the options for shooters who need corrective lenses. He learned a great deal in the process, and he shares his new-found wisdome in the section below. Shooting glasses must be shatter-proof. You have two main choices in shatter-proof materials: Polycarbonate, or Trivex™ made by PPG. Most optical shops will favor polycarbonate, because that’s what they sell the most of. However Poly is far from the best material in terms of optical properties. Glass is the best for optical clarity and lack of distortion, with an ABBE number of about 58 (the measurement of chromatic aberration, higher being better). Unfortunately glass lenses are heavy, (glass has a Specific Gravity number of about 2.50–the higher number the more weight). Worse yet, glass shatters. With conventional glass lenses, if a cartridge lets go at 60,000 PSI, you could lose an eye, or worse. Polycarbonate is very strong and shatter resistant. Unfortunately it only has an ABBE number of 30. This is not great optically, especially when you are looking off-axis. Poly, however, is much lighter than glass. Poly has a Specific Gravity number of about 1.20. So that leaves PPG Trivex™. Trivex is very strong AND very light, and rates well optically. Trivex™ is nearly as strong as polycarbonate, yet is even lighter (with a Specific Gravity of 1.11). With an ABBE number of about 45, Trivex™ is much better optically than polycarbonate. In addition, Trivex™ is chemically resistant to cleaning solutions, oil, and skin care products. 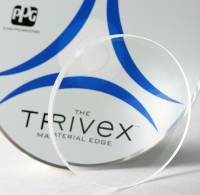 Trivex™ can be drilled, grooved and notched very easy, so it is well-suited for rimless glasses and sport glasses. CLICK HERE for TRIVEX LENS REPORT. I ordered a no-line bifocal. This was a compromise in itself since having a single focal plane for shooting might be a better bet, but then you may be forced to buy two pairs of glasses. Your lens prescription can also be optimized for scope-viewing by having the viewing axis ground off-center. But then again you may need a second pair for everyday use. After receiving my new eyeglasses, my first impressions of the Trivex lenses were how clear they were compared to my old pair of eyeglasses, and secondly how much lighter they were due in part to a lighter titanium alloy frame and the much lighter Trivex lenses. My digital scale bore this out with the old pair weighing in at a hefty 2.2 ounces with the new glasses tipping the scale at a svelte 1.3 ounces. .9-ounce doesn’t sound like much until you carry it perched on your nose every minute of your waking life. Believe me, it does make a difference. I chose a large pair of modified aviator style frames with a lens measurement of 58mm (horizontal measurement of the lens). Why the large size? The reason is twofold. First larger means more coverage with more protection, also not allowing excess light to enter from the sides, a plus for shooting. Secondly, since I have a progressive bi-focal the larger size allows a more gradual progression from top to bottom, another plus for shooting, and everyday wear. If I had chosen one of the more stylish smaller lens frames the progression out of necessity would have been more abrupt which I didn’t want. Going with the larger size you pay a small weight penalty but in my opinion the benefits outweigh the extra weight. Besides going with the titanium alloy and Trivex I more than made up for the slight weight gain. Nosepiece construction is another important choice that can be easily overlooked when buying new eyeglasses. I chose the one piece floating type instead of the two separate individual nosepieces because I feel they are easier on the nose. An added benefit for all day wear. The benefits of the anti-reflective coating I purchased was readily apparent while using the computer and under fluorescent lights but it really shines when driving at night and especially in the rain. It really cuts down on the glare of oncoming headlights. Another side benefit, which is purely cosmetic, is the absence of glare on your eyeglasses when another person is looking at you, or when your picture is taken for a photograph. All in all I’d definitely recommend a GOOD, and here I stress the word good, anti-reflective coating. All anti-reflective coatings are not created equal according to my Optometrist. Some are more prone to flaking, scratching, and accelerated wear than others. Choose wisely and let your Optometrist be your guide. The Transitions brand photocromatic lenses are really nice. By now everyone has seen the TV commercials “Where the Future is Now” and I must say they do operate just as in the commercials changing quickly from totally clear indoors to dark gray outdoors when exposed to UV light, and then back again when needed. How quick do they change? In the two photos included you can see the transition that has occurred after 30 seconds. A side benefit is all of the possible shades you get in between, not like conventional sunglasses that can be to dark in some mid lighting conditions. You get so used to the Transitions that you don’t even know what shade they are unless you look in a mirror. Instead of just assuming I could see better while shooting I got to thinking how my new prescription may have changed the ocular adjustment on my scopes. It stood to reason that if I had adjusted my scopes for a crisp image with my old prescription that I may need to tweak those adjustments now that I could see better. In my way of thinking what better way to get a sharp picture than the same way the optician does when doing your eye exam. 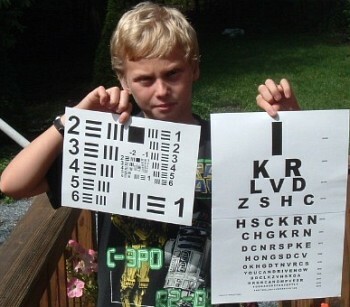 In the photo is my son Logan holding two eye charts I downloaded from the Internet on heavy card stock. One is the standard Opticians’ eye chart you are all familiar with, and the other is of the USAF design. By placing these at 100 yards with the scope on its highest power you can dial in a crisp picture. I also tried them at various other distances on a clear morning just to make sure I had my scopes ocular set as best as it could be. Another benefit is that it does give you an idea just how good optically your scope is. Works great when comparing spotting scopes also. How to care for your new eyeglasses is a major concern, especially when you consider the cost of premium eyeglasses with all the options. The recommendation of my Optometrist was to always rinse them off first with water followed by a wash of warm soapy water if needed then rinsed. Drying with anything but the special cloth provided is a definite no-no so forget the paper towels. He didn’t recommend the commercial special eyeglass cleaners since he cautioned that you don’t know the ingredients and they could have an ill effect on the anti glare coating. The special cloths are cheap so get a couple extra so you have one when you need it. They really work removing water quickly and streak free. They work great for those expensive optics also. My range box will always have one along with a bulb blower for camera lenses, and a little spray bottle of water also. I hope this has been of some help to others going down the road of aging eyes, as well as for the young guns with 20-20 vision looking for protection to keep them that way. Topics: Eyewear, Shields, Eye Glasses, Safety, Safety Glasses, Goggles, Googles, Eye Protection, Vision Protection, Shooting Glasses, Shooting Eye Protectors, Lenses, Polycarbonate, Tivex, SR-91, Kaenon, ANSI, OSHA, ANSI Z87.1, MIL-V-43511C, ESS, Safety, Plastic, Glass, Tint, UVEX, Pyramex, Ricochet, Targets, Prescription, Prescription lenses, Smith & Wesson, MIL STD 662F, XC, Genesis, Frames, NosePads, anti-fog, anti-scratch, impact resistance. All content Copyright © 2010 AccurateShooter.com | 6mmBR.com, All Rights Reserved.